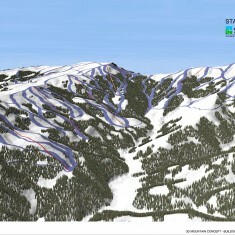 Stara Planina | Stara Planina | Ecosign Mountain Resort Planners Ltd. The Stara Planina (“Old Mountain”) study area is a mountain area extending along Serbian-Bulgarian Border over the territories of the municipalities of Knjaževac, Pirot and Dimitrovgrad. 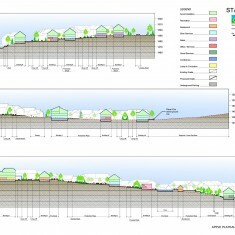 Ecosign prepared both mountain and village studies in 2006 and after client review a preferred concept was agreed upon. 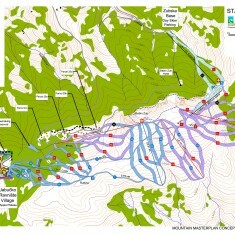 The mountain plan at build out consists of 30 lifts with a total Skier Carrying Capacity of 26,840 per day. 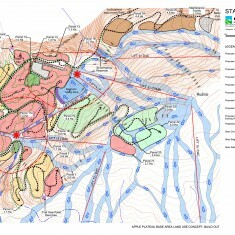 There are four main base areas proposed for development at Stara Planina: the Golema Base, Zubska Base, Leskova Base and the Jabučko Ravniŝte Base (Apple Plateau) Two of these proposed base areas shall be mainly for day skier parking and the other two base areas are proposed for accommodation and commercial center development. The main village (Apple Plateau) has a total building footprint of 101,650 sq.m. and a gross floor area of 295,333 sq.m. The buildings in the proposed village have commercial and skier services space on the ground floor, or pedestrian street level and then two or three levels of accommodation space above. Some of the buildings may have underground commercial and entertainment space and some may have commercial space located on the second floor, depending on the slope gradient of the building site and based on building construction solutions that help the buildings fit into the natural landscape. The main village will provide a total of 13,502 beds of public accommodation form 3,665 units, and shall generate 8,750 skiers.